Among the primitive crafts, basketmaking is one of the oldest known. Older than the weaving of cloth, more ancient than the early ceramic art, the interlacing of twigs into wickerwork is in all probability contemporary with first clipping of flint into arrow-heads. One of the oldest complete Baskets in the world is known to be from around 3000 BC (by courtesy of the British Museum). Basketmaking has been called the mother of pottery, as a potter used a basket mould long before the invention of the wheel. Pieces of Neolithic Age pottery show that the clay had been moulded around a basket structure. Stone Age pots often were ornamented with basketwork patterns. Although basketwork is of a more perishable nature than pottery, due to the extremely dry atmosphere and the preserving sand, it is chiefly in Egypt that ancient baskets in a good state of preservation have been brought to light after being buried for many centuries. The Basketmakers' Company possesses a small Egyptian "shabti" basket made of fibre, belonging to the XIth Dynasty and dated 2000 B.C. These rare baskets, found in mummy cases, contained food for the "shabti", little figures who accompanied members of the royal household in the after-life. The Company also possesses a fragment of pre-history coiled basketry lining dated about 4000 B.C. ​​​​​​​Moving through history, we encounter houses built of wattle, shields fashioned of wickerwork, coracles or very large baskets covered with hide which the Romans saw on the Thames when they first came to this land. The first Christian church in Britain, in Glastonbury in Somerset, had a roof of straw constructed on a structure of wickerwork. Relics from this Church dated first century A.D. have been found preserved in the mud deposits of ancient fenland. The first monastery of Iona founded in 563 A.D. by St. Columba was made of wickerwork as the early chroniclers have written "sent forth the monks to gather twigs to build their hospice". Thomas Birch, a basket maker in 1776, erected a scaffold of wickerwork around Islington Church steeple so the ascent to repair the steeple was rendered safe. Some two thousand Londoners paid sixpence for admission to the wicker staircase. ​​​​​​​Cries of the City of London series 1688. ​​​​​​​The Basketmakers had close links with the Butchers and Turners in the early years. The Basketmakers' Company was established by an Order of the Court of Aldermen on 22nd September 1569, and is fifty-second in order of precedence among the Livery Companies. 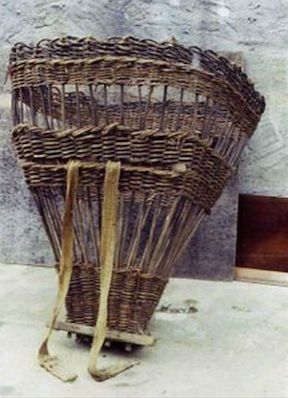 There are, however, earlier references to basketmaking in the City, particularly in the records of the Brewers' Company for 1422.By ancient custom, only persons free of the City were allowed to sell any wares by retail, or occupy a shop within the City or the Liberties thereof; a privilege which had been confirmed by several Acts of Parliament. Edward III encouraged the settlement of foreign artificers in London although Edward IV limited the number of apprentices and restricted foreigners again. Under his reign, (1461-1483), by an Order of Common Council dated 1463, basketmakers were restricted to Blanche Appleton, a district which had been set apart for aliens so the choice of this area was in the nature of a compromise as it allowed the foreign basketmakers to remain in the "City". Blanche Appleton was a manor situated in the parish of St. Katherine Coleman in Aldgate Ward, close to the present Mark Lane. By the end of the fifteenth century basketmakers were living in the parishes of St. Andrew Hubbard and St. Margaret Pattens. An old Vestry Minute Book of the latter has reference to fifteenth and sixteenth century basketmakers and their gifts or payments made to the church. By this time, "illegal" imports of baskets from Holland and the fact that Blanche Appleton included a large number of aliens, led to the "Evil May Day" riot in 1517 when London apprentices showed their ill-feeling towards the aliens in the locality by breaking windows and doors of their houses. The Lord Mayor and Aldermen quelled the riot and ten pairs of gallows were erected, one at Blanche Appleton. John Stow, in his Survey of London, says that in 1538 a disastrous fire broke out among the basketmakers in St. Margaret Pattens' parish, when more than a dozen houses were destroyed and nine people burned to death. In that year, the basketmakers were ordered by Common Council to leave the City on account of their alleged negligence. They petitioned against the Order which was suspended until 1541 when Henry VIII allowed Common Council to enforce their eviction from the City. There are no City records of the reinstatement, as a reference of Common Council on 8th January 1565 that refers to 'basketmakers of the City' appears to accept the eviction as a dead letter after the lapse of many years. Prior to 1569, English basketmakers obtained their freedom of the City and were permitted to practice their trade within its walls by joining the Butchers' Company, whose members used baskets extensively. In those days, Pudding Lane was largely inhabited by basketmakers, turners and butchers. Like the butchers, the turners not only used baskets but also sold them; and we hear of basketmakers becoming Freemen of the Turners' Company. Another early reference to basketmakers occurs in an Order of Common Council dated 1463, where it is set down that those practising within the City should reside at Blanche Appleton. Following the restoration of the monarchy in 1660, the Company made its first attempt to obtain a Charter from the Crown. Nothing, however, came of this nor of subsequent applications made in 1682, 1685 and 1698. Eventually a Royal Charter was granted by King George VI in 1937 and was personally presented by Queen Mary, when she attended the Guildhall Exhibition of basketware that year. The first recorded efforts to obtain the grant of a Livery took place in 1775, but it was not until 1825 that this was achieved, with a limit of thirty members. During the twentieth century there had been a steady increase in numbers to the permitted five hundred. The Basketmakers' Livery currently stands in the region of three hundred.